Call me Bree, I'm a dyke. I'm addicted to body mods. One day, I am going to make someone the happiest girl alive. It's just a post of mine that I made on an rpg. I know it's short, but eh. Anyway, someone suggested that I should continue on, making a short story. What do you think? I was stalking your Tumblr and your girl's Tumblr? You two look happy and fulfilled and lesbianish! Perfect! Wait, but isn't Massachusetts crazy? You should change your profile to "I have made someone the happiest girl alive." 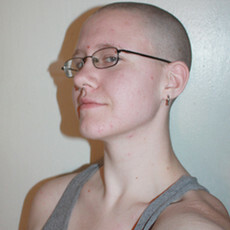 HEYY GURLLL that is a nice shaved head you got there! Me and my blobs are fantastic! Been volenteering at an art camp. Ohhh the love I'm feeling!